Confucius Institutes in Australia are problematic. Amidst heated public discussions about the new foreign interference laws, their right to operate on university campuses has been questioned: Should Australian universities allow Confucius Institutes, which have been accused of undermining freedom of expression on matters sensitive to the People’s Republic of China (PRC), to continue to teach Mandarin and promote Chinese culture on Australian campuses? The answer is not clear-cut. Today, 14 of the world’s total 525 Confucius Institutes (CIs) are located in Australia. CIs teach Chinese language and culture and are co-funded by the PRC government. In most cases they act as an ancillary arm of a university and provide Mandarin classes to the wider community, though some also teach subjects for academic credit. The institutes organise cultural performances, public lectures, speech competitions, and exchange programs with partner universities in the PRC. They ultimately report to the PRC Ministry of Education. 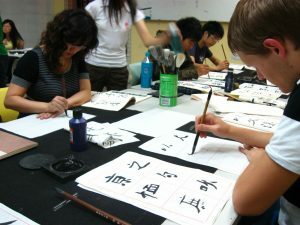 Australians need opportunities to learn Mandarin and Confucius Institutes provide classes taught by trained native speakers. The recommendation that the federal government provide millions of dollars in additional funding for alternative Mandarin programs is unrealistic. Proponents see universities as benefiting from Beijing’s largesse and adequately equipped to address potential challenges. Critics, on the other hand, argue that the institutes threaten to undermine academic freedom, allow the PRC government to gain undue influence within universities, and spread propaganda of the Communist Party of China (CPC). Given the ongoing debate about the foreign interference laws, similar proposals to categorically terminate CIs are bound to arise in Australia. At the same time, increasingly repressive developments in the PRC are a cause for alarm. Under Xi Jinping, the Communist Party has strengthened its control over the state apparatus. The Office of Chinese Language Council International (Hanban), which oversees Confucius Institutes, will face CPC pressure to restrict discussion of topics sensitive to Beijing. Hanban will be less inclined to compromise in negotiations with current and future partners regarding curricula, teaching materials and management of CIs. Australian university administrators are likely to soon find themselves between a rock and a hard place: an inflexible Hanban on one side, and Australian government agencies and politicians on the other. Pressure from both sides will mount, so it is in the interest of university administrators to take action now. This policy brief argues that university independence should be maintained. The author recommends that each Australian university that hosts a Confucius Institute re-examine its contract, increase supervision of CI activities, and enforce stringent safeguards to protect freedom of expression. Yet it is difficult to identify specific instances where a Confucius Institute has overstepped its boundaries. Even a 2017 report by the conservative National Association of Scholars in the US, which recommended the closure of American CIs, could not provide any concrete examples of violation of academic freedom. One offensive case in Europe is well-documented: Hanban interfered with the program materials of a European Association of Chinese Studies conference in 2014. Australia has thus far avoided such incidents – no case of infringement upon academic freedom has been publicly reported. Self-censorship is a potential risk if Confucius Institutes become the only option for China studies at Australian universities. In such a case, Beijing would gain considerable influence over how China’s history, politics, and society are taught in universities. Currently, CIs in Australia do not offer credit courses on the PRC’s politics, economics or foreign policy. A second potential risk is the undue influence the PRC government could gain in Australian universities through Confucius Institutes. In contrast to other language institutes sponsored by foreign governments such as the Goethe-Institut of Germany, CIs are attached to individual universities. Critics argue that PRC staff at CIs are thus strategically well-positioned to infiltrate local academia. They argue that university issues should not be decided by individuals who report to Hanban and probably have links to the CPC. Accusations tend to overstate the degree of influence the CI staff wield within the university bureaucracy. CIs are essentially joint ventures: each one operates under the guidance of a director, a board, and committees integrated into the host university. The institute is set up as a legal entity within the university; all legal documents are examined by the legal office and approved by the vice-chancellor. Institute staff submit funding applications for activities in accordance with standard procedures. Individual CIs in Australia function with a large degree of autonomy and receive limited supervision from Hanban. Far from blindly accepting Hanban’s directives, university staff primarily decide class curricula, teaching material, and the overall direction of an institute. Each conforms to the local director’s vision and the evolving demands of the university. A Confucius Institute that operates in Perth is substantially different from one in London, Tokyo, or Cairo. Even in Australia, institutes differ notably. The CI at the University of Sydney concentrates on culture and artistic performances. Its counterpart at the Royal Melbourne Institute of Technology focuses on traditional Chinese medicine. Decisions to terminate individual agreements such as at Pennsylvania State University and the University of Chicago should be viewed through this lens – as distinct joint ventures that did not meet the university’s expectations and not a symptom of the entire CI program. However, Australian administrators should prepare for Hanban to become less flexible in negotiations due to the CPC’s intent to increase control over all matters related to education. Hanban may seek to revise existing arrangements, insist upon certain teaching materials, or narrow the field of ‘acceptable discussion’. University administrators need strong and transparent safeguards in place for such an eventuality. A third risk critics raise is that language courses and public events at CIs serve as propaganda platforms for the CPC. The Communist Party would likely agree. In 2009, senior PRC leader Li Changchun said that Confucius Institutes were an ‘important part of China’s overseas propaganda set-up’. Critics argue that partner universities essentially ‘engage in the political and propaganda efforts of a foreign government’. They promote the Party’s position on the Falun Gong, Tibetan, Uyghur, and Taiwanese independence movements, and so on. Hanban’s partnerships with Australia’s prestigious universities inherently lends legitimacy to these positions. The most controversial case to date in Australia was a 2012 public lecture by Zhang Yun, a staunch critic of the Dalai Lama at the CI of the University of Sydney. At the 2016 annual Confucius Institute conference in Kunming, directors were told to promote the PRC’s strategic objectives, such as the Belt and Road Initiative (BRI). How or whether Australian CIs will follow these instructions remains to be seen. The CPC’s propaganda techniques are not always overt. Their objective is to instil Australian academics, students, and the public with a favourable view of the PRC’s agenda. This is precisely what all governments seek to accomplish through public diplomacy. Yet the CPC’s propaganda is not necessarily achieved through active promotion, but by omission. Beijing strives to fulfil its political objectives by limiting or preventing discussion of topics such as Tibet, Taiwan, and Tiananmen. Herein lies the difficulty in setting parameters: there is nothing wrong with public debate about the potential benefits of engagement with the BRI, or Beijing’s position on the South China Sea dispute. To restrict such a discussion would breach academic freedom. Still, if an individual institute becomes a platform to overtly and one-sidedly support Beijing’s strategic objectives that should be considered grounds for termination. Australia must approach Confucius Institutes with principled pragmatism to safeguard academic freedom. Australian universities need to address legitimate concerns surrounding CIs. Heightened vigilance is required for any foreign body operating on a university campus, especially one sponsored by a one-party authoritarian government. At the same time, it is unreasonable to propose that Australian universities should categorically terminate their Confucius Institute agreements without clear and specific reasons. Potential security concerns directed at CIs should not be ignored. Yet government agencies and politicians cannot be allowed to strong-arm universities with vague and unsubstantiated claims. To uphold academic freedom means to safeguard campuses from undue government influence – be it from the PRC, the United States, or even the Australian Federal Government. It is in the interests of Australian universities that host a Confucius Institute to act now to pre-empt pressure from both sides. Strengthening existing safeguards can help a university avoid damage to its reputation that would be inevitable if controversy arises about its CI’s activities. Transparency is important to combat propaganda and will help assuage public concerns about Confucius Institutes. What does this mean for Australian universities? Each Australian university that hosts a Confucius Institute should form a working group of independent experts to review the university’s contract with its CI to ensure the university’s unilateral control over all academic matters. If necessary, the contract should be re-negotiated. The contract between a university and its Confucius Institute should be made publicly available on the university’s website, as should all information on curricula, teaching material, and board members. Student surveys should be used to assess each Confucius Institute lecture and language program. The student survey should probe issues of self-censorship or infringements on freedom of expression, and be conducted by independent university faculty members. Independent university faculty members should conduct an annual review of each Confucius Institute. The reviewers cannot be Confucius Institute board members. The Go8 should develop a uniform code to outline terms of an agreement between an Australian university and foreign government when they sponsor a joint project on campus. This code should provide clear standards to hold a Confucius Institute accountable to and define parameters for termination in case these standards are breached. A university should maintain control of the composition of its Confucius Institute board by appointing the majority of the board’s members. A university should not incorporate a Confucius Institute into its China studies department. Students should be offered classes in Chinese history, PRC foreign policy, politics and society by non-CI university faculty. Jackson Kwok is Policy Analyst at China Matters. He joined China Matters in 2016 as a research assistant. He previously consulted on PRC media for the East Asia Program at the Lowy Institute for International Policy. He holds a Bachelor of Arts (Languages) with First Class Honours in Government and International Relations from the University of Sydney. Author’s note: The focus of this brief is on Confucius Institutes, not Confucius Classrooms which operate in primary and high schools. A separate policy brief is warranted to focus on the challenges of Confucius Classrooms. Particularly problematic is the Confucius Institute within the NSW Department of Education that has responsibility for the establishment of Confucius Classrooms in NSW public schools because it places PRC personnel in an Australian government department. Editor’s note: The recommendations in this issue have evoked more than the usual contention among the eight reviewers, in part because of the subject and in part because of the current climate in which anything PRC-related is controversial. China Matters does not have an institutional view; the views expressed here are the author’s. This policy brief is published in the interests of advancing a mature discussion of the place of Confucius Institutes in Australia. Our goal is to influence government and relevant business, educational and non-governmental sectors on this and other critical policy issues. A response by Mr Louis B. Schwartz, President of China Strategies, Pittsburgh, USA. A response by Mr Jonathan Lim, East Asia Fellow, Young Australians in International Affairs. 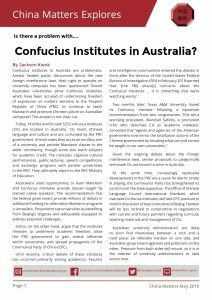 In this policy brief, Jackson Kwok, China Matters Policy Analyst, addresses the question, ‘Is there a problem with Confucius institutes?’, and suggests several measures that could be taken to mitigate the risks associated with the operation of Confucius Institutes on Australian university campuses.